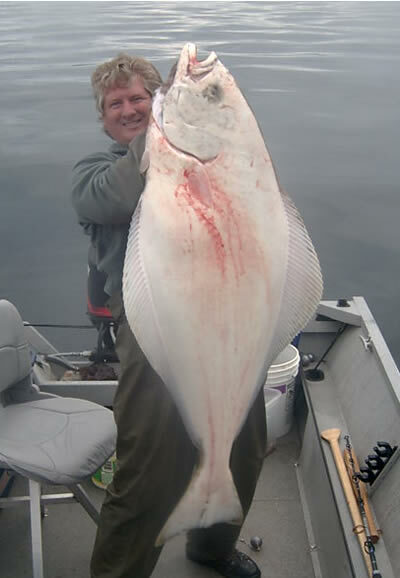 Filleting an Alaska Halibut is a pretty straightforward affair. If you've properly bled your catch at sea, and kept it well iced, the fish should be firm and ready for a knife by the time you hit shore. 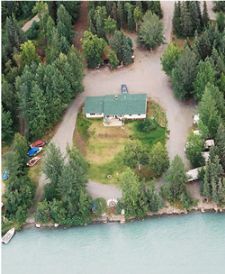 In the ports of Homer and Seward, community fish cleaning tables, with running water, are located just up from the small boat harbor at the main ramps. If you haven't performed the task before, look for a local to hire who will cut your fish in minutes for a few bucks, rather than see you butcher a perfectly innocent creature over the course of an hour. After watching, you'll have learned a thing or two, and given a sharp knife you can probably do some damage to these simple to clean fish. God helped make Halibut easier to clean than most fish, by putting a dotted line down the center of each side, the dark side most likely representing you know what, and the light side, well the goodness and purity of His oceans I'm sure. Follow His dotted line with your knife, pressing in deep enough to use the back bones as a guide as you move from the head end to the tail. After making this long cut, choose one half of side #1 or the other and begin to cut down against the bones as you proceed again from the head end toward the tail, with long smooth strokes of the knife producing the best results. After one half of side #1 is cut along the bones all the way to the fins, simply make a cut along the edge of the fish to release the fillet from the carcass. Repeat the same process on the other half of this side, working around the stomach and innards delicately so as to expose little to none of the nasties inside, especially the green and yellow yuk. When both fillets on side #1 have been released from the carcass, simply turn the fish over and repeat the same, starting along the dotted line again, until you end up with four nice fillets. Rinse the fillets free of as much of the slime, gray gunk, and debris as you can--though you may need to give it a final quick rinse at home before you pack it for freezing. Now for the skin. No matter what anyone, young or old, native or newby tells you, do not, I repeat DO NOT leave the skin on this fish. Remove it immediately, by whatever means necessary, or your once beautiful, clean fillets will be covered in slime before you can say "Slimey suckers slipped somebody a shiney, slippery sack of slime!". Halibut slime is about the worst of all fish slimes, and the stench found on anything you haven't cleaned by the next day is enough to make you heave ho. How to remove the skin easiest you ask? Why, with a sharp knife of course! It's pretty easy actually, once you get the hang of it. Having an insulated rubber glove helps too, for gripping the slimy skin, and for you some protection from the pointy, sharp thing too. Two methods are common. Either grip the tail end of the fillet firmly, by cutting a notch if necessary, and sliding the fillet knife down at an angle pressing toward the skin and the cleaning table as you slide it down the fillet, leaving little to no meat on the skin. OR, make an angled cut through the center of the fillet, and work in opposite directions toward the tail and toward the belly, in the same sliding, angled manner, removing the skin from 1/2 of the fillet at a time. The latter proves a little more efficient on bigger fish, while the former works fine for the little "chickens" as we call them. Photos & video to follow soon.